This recipe was created by Pappa Razzi's. Original recipe is posted here via Providence Journal. Makes 4 servings. 1. Peel and dice eggplant to inch cubes. 2. Place in a colander, sprinkle with kosher salt and top with a weighted pie plate or metal mixing bowl. 3. Place in refrigerator with a pan under the colander to catch the released liquid. NOTE: The 24-hour pressing of the egglant is important for releasing the natural bitterness of the eggplant, therefore enhancing the taste and texture of the Cavatappi Affumicati. Day 2: Approximately three hours before you plan to serve your guests, marinate the slivered garlic, fresh basil, plum tomatoes, salt and black pepper in the 1/2 cup extra virgin olive oil. Remove eggplant from the colander, discard liquid and pat eggplant dry with a paper towel. In a medium saute pan, heat the 2 tablespoons of 100 percent pure olive oil to smoking point (do not use the extra virgin olive oil here as it has a lower temperature smoking point) and saute the eggplant until golden brown. In a large saucepan, cook the cavatappi for 5-7 minutes until al dente in 6 quarts of rapidly boiling salted water. While pasta is cooking, assemble the sauce. In a large saute pan, heat the eggplant for approximately 1 minute before adding the marinated tomato, garlic, basil mixture. Use medium heat for 2-3 minutes until ingredients are heated through (and the tomatoes are still firm). 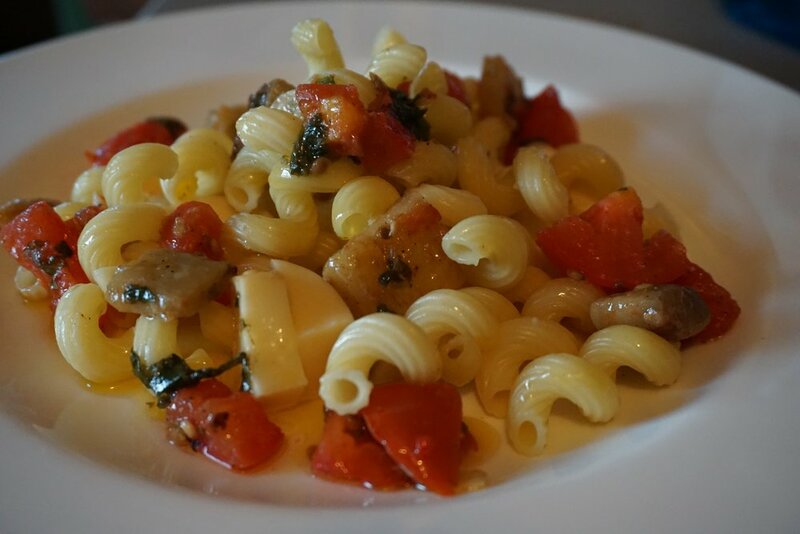 At the last minute, when you are ready to serve, add the smoked mozzarella and toss in the drain and cooked cavatappi. Add 2 tablespoons of pasta water and check seasonings. Place in a warm serving bowl and garnish with fresh grated romano cheese.